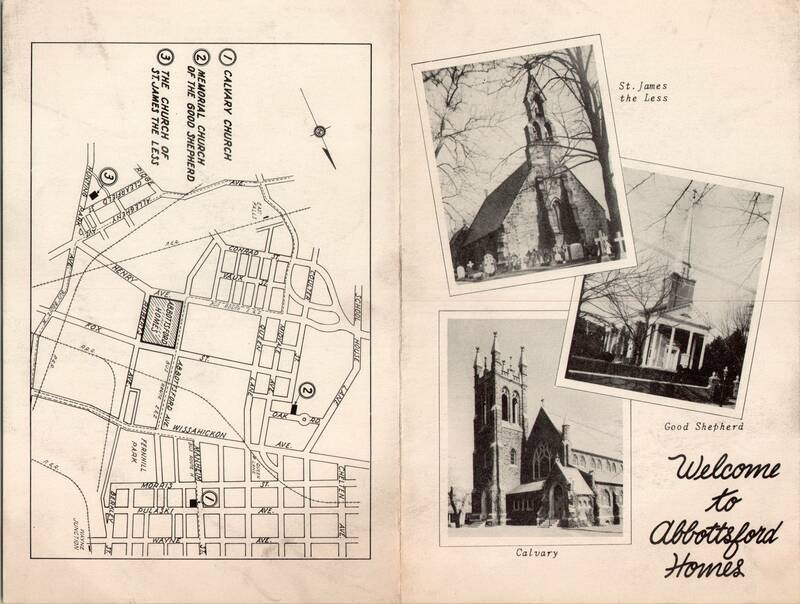 This entry was posted in Calvary Church (Germantown), Church of St. James the Less, Memorial Church of the Good Shepherd (Oak Road) and tagged Abbotsford Homes, Allegheny West, Charles Jarvis Harriman, East Falls, Germantown, Hugh E. Montgomery, Northwest Philadelphia, William J. Dietrich Jr. on February 22, 2015 by mjk38. 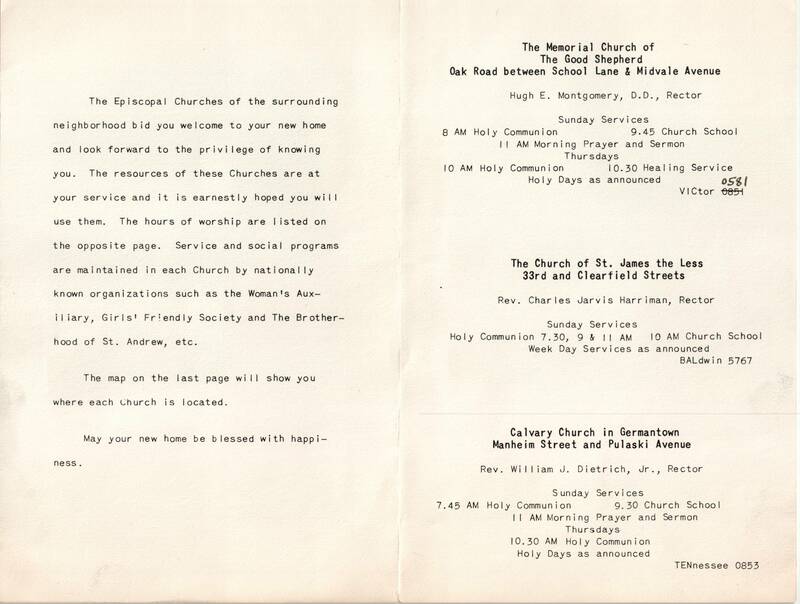 This entry was posted in Memorial Church of the Good Shepherd (Oak Road) and tagged Church News of the Diocese of Pennsylvania, East Falls, Henry W. Brown, James De Wolf Perry, Northwest Philadelphia, Philip M. Rhinelander, Thomas J. Garland, William Y. Edwards on January 27, 2015 by mjk38. 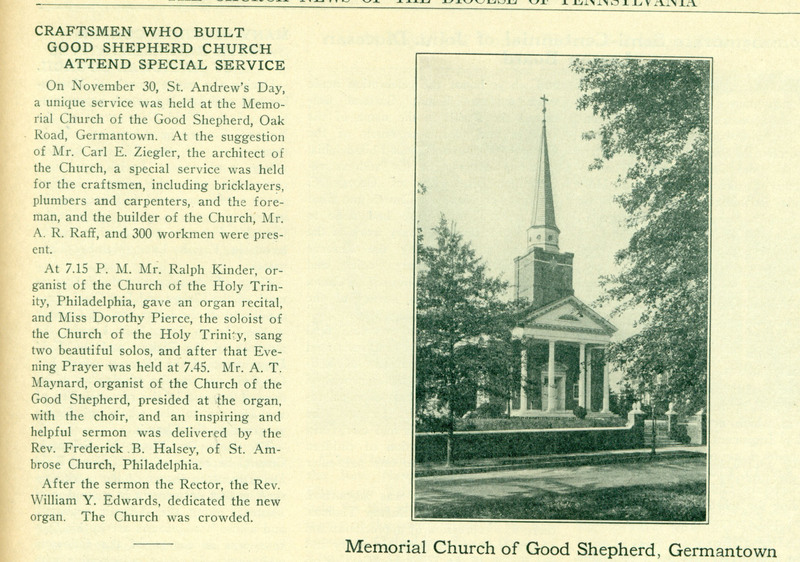 This entry was posted in Memorial Church of the Good Shepherd (Oak Road) and tagged Carl E. Ziegler, Church News of the Diocese of Pennsylvania, East Falls, Northwest Philadelphia, Ralph Kinder, William Y. Edwards on July 21, 2014 by mjk38. This entry was posted in Memorial Church of the Good Shepherd (Oak Road) and tagged Church News of the Diocese of Pennsylvania, East Falls, Northwest Philadelphia, William Y. Edwards on July 21, 2014 by mjk38. 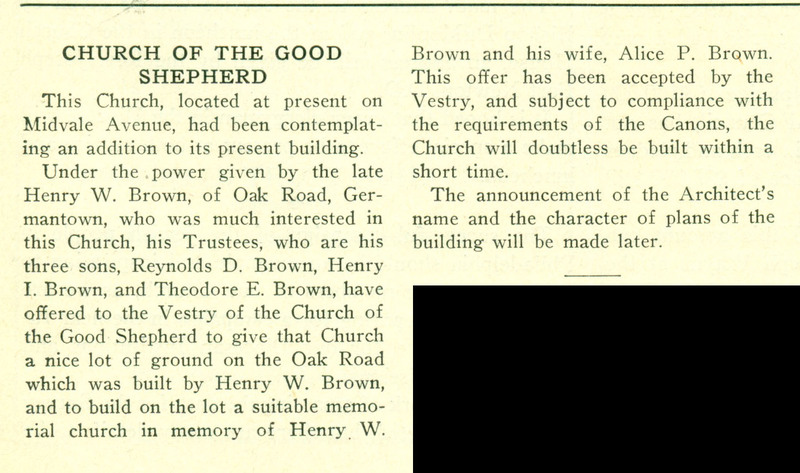 This entry was posted in Memorial Church of the Good Shepherd (Oak Road) and tagged Church News of the Diocese of Pennsylvania, East Falls, Henry I. Brown, Henry W. Brown, Northwest Philadelphia, Reynolds D. Brown, Theodore E. Brown on July 20, 2014 by mjk38.